OK, so we’re a little behind on the poll results this week. Sorry. I was in Los Angeles for a little business meeting/vacation (including a visit with a Darth Vader himself!) and didn’t get back until last night. Now I need a vacation from my vacation. But the polls must go on! Last week we asked about your worst nightmare on a Sunday morning. 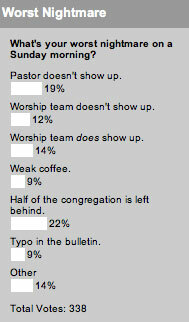 And the number one answer was having half the congregation left behind. Not far behind that was having the pastor not show up. We also let you write in your own answer, which 14% chose to do. One answer that appeared several times in various forms was not having God show up on Sunday morning. Yes, that would be quite the nightmare, but taking the poll seriously just doesn’t get the same laughs. Like this response: “Ex-stripper guest speaker turns out to not be so ‘ex'” Now that’s funny! This week we asked about that favorite October holiday, Halloween (OK, how many were thinking Columbus Day?). I wish you’d have another option on your halloween poll. Our church does not have a Halloween (or harvest) party, but do we completely ignore it either. Halloween gives us a platform to talk about Witches, ghosts, horrow movies and the rest of Satan’s devices. I guess you could say we don’t ignore halloween, but we do not cast it in a positive light either. When David Crowder was a worship leader for University Baptist Church in Waco, he and the entire worship team forgot to reset their clocks for a time change. The church had the sermon first and then had worship when Dave and the band showed up.